... I agree with Reichu on this one. A good, for instance, especially in regards to the "cause-effect," is seen in Episode 1 when Yui moves her arm to defend Shinji-kun. She moves without power, without a pilot and without an entry plug. Clearly ... Yui is the force protecting her son. How the soul moves the body is another question entirely. Given I don't think the Eva's body has metabolic processes without power (I believe something like this is mentioned somewhere ... maybe ... I could be wrong), the soul must somehow be providing this. Sheer will perhaps? Will and the human soul (in my opinion) are far greater than any physical force (electricity/energy included). Now stop drawing my attention! I have to go insane for a couple days now. Only if it services the plot. Personally, I always thought that the pilot's emotional state might help serve to ROUSE the resident soul into action, but it is not a direct cause-effect relationship. yes, it's not direct cause-effect relationship, but it still seems to contributes greatly in many occassions. And eva's own will to go berserk just doesn't make sense in many occassions, as evas could have simply gone berserk and defeated the angels to save themselves and more, but most of the time they just get totaled. In ep 1 eva 1 does move without a pilot, which suggest evas are "awake" all the time. If they are awake constantly, than their other bodily fuctions, such as breathing for oxygen and heart beating for blood must be constantly active... and as Reichu explained before, electricity alone does not supply the energy for the body... which means either eva is completely different from humans that they don't need stuff like eating and breathing and etc. (which must be true if evas have no fat, since human can only really truly achieve 0% body fat when they die), or umbilical cords soup up the evas with something other than electricity, like some sort of chemical. The easiest explanation is I guess soul in eva is not really eternal, but rather on different level of physical-ness. That would explain the source of power for berserkers, and also how many brain-less angels function the way they do with some minimal intelligence. I just find it ridiculous that Ritsuko claimed something like over 90% similarity in genetic makeup between the angel and humans... their bodily fuctions just doesn't make sense in terms of mammals, and I just don't see how having identical blue print result in completely different result. The question is... can you really convert will power into some sort of physical one? I am very materialistic and since I don't really wanna go off topic on this one I guess than berserker's power remain in total mystery so far, which I doubt us eva geeks here will be willing to accept. Gaizokubanou wrote: yes, it's not direct cause-effect relationship, but it still seems to contributes greatly in many occassions. And eva's own will to go berserk just doesn't make sense in many occassions, as evas could have simply gone berserk and defeated the angels to save themselves and more, but most of the time they just get totaled. If NGE was engineered to make complete, practical sense, we would be dealing with a rather different show. As I said before, they go berserk when it services the plot. In ep 1 eva 1 does move without a pilot, which suggest evas are "awake" all the time. If they are awake constantly, than their other bodily fuctions, such as breathing for oxygen and heart beating for blood must be constantly active... and as Reichu explained before, electricity alone does not supply the energy for the body... which means either eva is completely different from humans that they don't need stuff like eating and breathing and etc. Evas seem to be inherently odd in this manner. It is apparent that the heart is beating while the Evas are in use, since we have that blood spurting all over the place , but we only see signs of breathing when they are in a 'berserk' or dummy-plugged state -- not sure if that really means anything, though. However, despite the fact that they have these and other body processes, they are not "necessary" for life, or even for the sort of constant awareness that Evas seem to have, even in their suppressed, Caged ("quiescent", as Mr. Tines would say) state. The core is the base of their life force and consciousness, and that is what really matters. That are their 'angelic nature', I imagine, is what makes the Eva body quite a bit more hardy than the flimsy organic machines we inhabit. The Evas are not reliant on outside biomass, water, and air for life the way that we are, and for this reason they can survive long periods of complete inactivity, massive mutilation of their bodies, or even existing within the vaccum of space. So long as the core is intact, survival is guaranteed. This is really just a guess on my part, but the Evas honestly too look like they're bone, muscle, organ, skin, and very little else. or umbilical cords soup up the evas with something other than electricity, like some sort of chemical. When we see the cord severed in #03, it's apparent that the only thing being transmitted by that thing is electric power. The easiest explanation is I guess soul in eva is not really eternal, but rather on different level of physical-ness. That would explain the source of power for berserkers, and also how many brain-less angels function the way they do with some minimal intelligence. I just find it ridiculous that Ritsuko claimed something like over 90% similarity in genetic makeup between the angel and humans... their bodily fuctions just doesn't make sense in terms of mammals, and I just don't see how having identical blue print result in completely different result. Well, the Angels can justify this by virtue of the fact that they are GENETICALLY supposed to be humanoid, but CHOSE to inhabit a different form altogether when they were born. As Misato put it, they "rejected" human form. Had the Angels not done this, they probably would have looked much like Adam and the Evas. The soul is clearly a very real, but mysterious, force in NGE. It can maintain the complete human consciousnes independent of the brain. Who knows what else it might be capable of? There are different ideas about souls, and some believe that they are corperal things that cannot truly be affected(either destroyed or created) by physical means. However, in eva if souls could interfere with physical world in physical sense(supplying berserkers with raw energy), that could very well mean that they could be interfered by physical things, which makes them just another physical state, not something on whole different level. I'm satisfied to just say "chutzpah" and be done with it, heh. I've wondered whether the fluid baths we often see the Evas immersed in have some sort of nutrient (probably labelled as "maintenance") role. ...what?? Are you talking about the thick vapor that escapes from Kyoko's intestines where the harpies rip them apart? Tines-san: I thought it was pretty evidence that those "fluid baths" were coolant used to 'refridgerate' the Evas. It seems to be implied that with the B-Type Armor equipped, cold temperatures help render the Evas inert, even when there is a pilot in control, as observed with EVA-02 in #08. This is about the most I've been able to figure on the issue, though; it doesn't get discussed an awful lot. One interesting thing is in #05... While both Evas are being 'refridgerated', there is some intercom talk about waste fluids being removed, or some such thing. That's always led to a bit of speculation on my part. Gaizokubanou wrote: There are different ideas about souls, and some believe that they are corperal things that cannot truly be affected(either destroyed or created) by physical means. However, in eva if souls could interfere with physical world in physical sense(supplying berserkers with raw energy), that could very well mean that they could be interfered by physical things, which makes them just another physical state, not something on whole different level. Actually, philosophically this isn't the case. The soul can easily interact with the physical world without having a reverse relationship to the physical world. I'll try to think of an example and get back on that later. In other words, it's a fallacy to suggest that just because one thing can affect another, that it necessarily follows that the latter can affect the former. If A affects B, it doesn't mean B can affect A. It's possible that this *can* be the case, but it isn't *necessarily* the case. In fact, I wouldn't go so far, even myself, to say that the physical world has no "effect" on the soul. But what I am saying is that just because one affects the other does not mean they are both on the same "playing field." If I'm attacking from the air, I can affect troops on the ground. It's possible they can affect me as well, but it's not necessarily the case that they can, or will. But the point is, despite being able to interact with one another, it is very clearly the case that one is in the sky, and the other is on the ground. ... I wonder if any of that makes sense. ... We need more philosophers in this world . Knives wrote: Actually, philosophically this isn't the case. The soul can easily interact with the physical world without having a reverse relationship to the physical world. I'll try to think of an example and get back on that later. But then, since the core houses the soul, could one assume that damage sustained to the core effects the soul indirectly? Just a passing thought really, but I always thought that once that soul was contained within the core it took on a sort of ''physical status'', thus liable for damage. Considering that Evas have no body fat to speak of, and Nerv never feeds them, and various other things that I can't remember right now, I'm personally skeptical about the energy from the berserk incidents having metabolic origins. Is it really so farfetched that maybe the soul might be able to produce limited bursts of energy of its own accord? 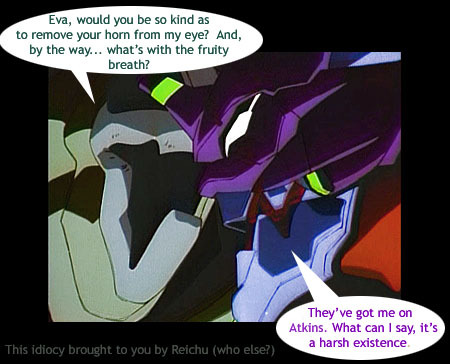 I'm not refuting this, it just seems to fit well if we think of the soul as initiating the metabolic systems within the Eva once it takes control. Needless speculation sure, but what if the soul did set of a chain reaction of citosis in the Eva. Just a thought, but what if the LCL being injected into the entry-plug was the Eva's form of consumption when it comes to being ''fed''. Even though it appears to be only transfused into the plug, maybe the filtering systems direct a certain degree of it to the Eva itself. Anon. wrote: But then, since the core houses the soul, could one assume that damage sustained to the core effects the soul indirectly? Just a passing thought really, but I always thought that once that soul was contained within the core it took on a sort of ''physical status'', thus liable for damage. Indirect effect is not direct effect. In the case of destroying the core, it frees the soul, but does not (as far as we can tell) damage the soul. I actually just mentioned the citosis bit as a joke. (I'm tongue-in-cheek as often as I'm serious. Haven't you noticed? ) The idea of the Evas breaking down their own muscle mass to power these "berserk" (that term used in reference to Evas is an artifact of liberal translation, BTW) bursts of activity just seems silly to me. Of course I took that into consideration that's why I was careful to say "could very well mean". The problem with souls in eva is IF they do indeed somehow power up the berserkers, they are causing effects that are just too physical, and if souls in evas are suppose to be corporal things that are in completely different field from physical things, I don't see how it makes sense. For ecample, in your air vs ground example, yes those two are in different playing field, but air interacts with ground through particular method(in this case, a missle or bomb). And ground can also cause an effect on air with similar method(aa missle). I am not denying that souls are on different playing ground than most of the physical stuff, but as your example shows a method of interaction between different fields, souls can be interfered, and in eva it seems to me that physical objects can interfere with souls directly through physical means. Thus, souls in eva shouldn't be some eternal, physics defying things but rather souls can probably be understood and controlled through physical studies. How Yui somehow "moved" her soul from one body to another through science is clear indication of this. Edit: hehe I'm taking a philosophy class right now, and I technically got an A fro the whole semester in first two lectures. I think it's pretty clear that even though technology can do all sorts of wacky stuff in NGE, humans are still messing with a lot of things they don't understand at all. I think all of the "moving without power" incidences are supposed to be this sort of thing. "We've got this thing we thought we could control, but we can't because we really don't know what the hell we're dealing with." Remember how badly Ritsuko reacts to Yui just moving her arm. The idea of the Evas being mysteriously powered by "soul juice" (as I call it) seems to fit overall better than trying to explain it on something more tangible, like the whole citosis thing. Honestly, no one was supposed to take that seriously. Well Gendo seemed to be pretty confident about Eva 1 going berserk... and I doubt he would be if it took him completely by suprise. Gaizokubanou wrote: I am not denying that souls are on different playing ground than most of the physical stuff, but as your example shows a method of interaction between different fields, souls can be interfered, and in eva it seems to me that physical objects can interfere with souls directly through physical means. Thus, souls in eva shouldn't be some eternal, physics defying things but rather souls can probably be understood and controlled through physical studies. How Yui somehow "moved" her soul from one body to another through science is clear indication of this. Mmm .. careful there. If souls aren't "eternal, physics defying things" then they aren't souls at all and this entire discussion and Evangelion as a whole are moot points. I suggest looking into Descartes and his Meditations on Philosophy (I think that was his book .. too tired ). He goes pretty in depth on that subject. Knives wrote: Mmm .. careful there. If souls aren't "eternal, physics defying things" then they aren't souls at all and this entire discussion and Evangelion as a whole are moot points. While it is admirable, in a way, to edify yourself regarding what the Great Thinkers have to say on the subject and all, you need to keep in mind that NGE is a work of fiction, in which Mr. Anno, in his capacity as creator of the world in which NGE takes place (which features stuff like LCL, A.T. Fields, soul transference, not to mention Giant "Robots", and other scientific impossibilities), is free to posit his own rules regarding how all this stuff works, which, alas, he rarely sees fit to spell out explicitly. Yes I understand that's the whole purpose of the soul in "real life" philosophy, and that was my reason for this argument to show that in eva it seem to follow a whole different concept of "soul"
Shin-seiki wrote: While it is admirable, in a way, to edify yourself regarding what the Great Thinkers have to say on the subject and all, you need to keep in mind that NGE is a work of fiction, in which Mr. Anno, in his capacity as creator of the world in which NGE takes place (which features stuff like LCL, A.T. Fields, soul transference, not to mention Giant "Robots", and other scientific impossibilities), is free to posit his own rules regarding how all this stuff works, which, alas, he rarely sees fit to spell out explicitly. And yet, as soon as you start suggesting this to be the case (that is, to say that anything is possible, we don't have to fit within the bounds of reason), then nothing and everything is explainable simultaneously. In order to argue anything, you have to have some grounding in some school of thought, be it science or philosophy. Both are sciences — they can be discussed through reason and intellect. Shin-seiki wrote: It seems to me that you occasionally resort to arguments that basically amount to "This is how I would handle it if I were Anno, therefor I will shoehorn what we see going on in NGE to conform to my own notions and expectations, based on "external" philosophical concepts, or my own conception of what NGE, as a whole, means." I'm sorry it seems that way. Allow me to clarify, for that is not what I am saying. When we argue in the sciences I'll say, "If it's the case that x is y and y is z, then x must be z." The same can be said for philosophy. If I say, "x is y and y is z, then x must be z." What I'm hearing is that you want to throw philosophy out the window. But I'm afraid you can't do that (especially in relation to this series). To do so means you can explain anything by any means you wish (magic, fairies, dreams, demons, etc.). I, on the other hand, am sticking to something which can be thought about and considered through reason and intellect. If you're suggesting this isn't how we should go about watching and considering Evangelion (which I don't believe you are), then I suggest you reconsider your thoughts on the matter of philosophical discussion when it comes to this series. It's already been stated in so many words ... but this just helps illuminate my point. When this becomes your only defense ("it's Anno's 'world'"), you no longer have any basis for discussion. As soon as you stand by this defense 2+2 becomes 5, North is West, dogs meow and cats chase cars. It's simply not a valid defense, and it doesn't help to further the discussion. Knives wrote: When this becomes your only defense ("it's Anno's 'world'"), you no longer have any basis for discussion. Not really; "Anno's world", to the extent it diverges from the real world, nonetheless operates within reasonably self-consistent parameters (well, most of the time, at least), and one of the reasons that a forum like this exists is to explore and comprehend what the pseudo-scientific and psuedo-philosophic/religious groundrules that underpin the story are. Knives wrote: What I'm hearing is that you want to throw philosophy out the window. You are comparing things that are not comparable. There is a difference between Descartes thoughts on an abstract concept like a soul, and simple reason. No one brings up fairies as an explanation to the mechanics of LCL because there isn’t any mention of fairies. It is completely unreasonable to do so. We do however get an idea if what Anno wants us to know about souls in the universe he created. Saying Descartes or any other philosopher thinks differently, so we should as well, is silly because we are dealing with a work of fiction, which is dealing with something that hasn’t even be proven to exist! I could just as easily say philosopher X, Y and Z say there is no such thing as a soul, so we shouldn’t bring it up in a discussion. There are countless philosophers who all think different and conflicting things. So to guess which ones Anno is drawing on is a shot in the dark anyway.